Recent House vote proves renewable fuels are on the chopping block. Industry needs to pick a plan and stick with it, experts say. A lot was said of the 286-to-135 House vote that overwhelmingly supported withholding funding from the U.S. EPA's effort to move E15 to the marketplace during the 2011 National Ethanol Conference, which kicked off yesterday. With a budget shortfall of nearly $1.5 trillion, this vote is indicative of Congressional efforts to cut spending. Despite a lot of talk about the recent vote on the "Sullivan Amendment" (the E15 funding block was proposed by Rep. John Sullivan, R-Oklahoma), industry leaders widely believe the vote will not pass the Senate or President Obama's desk. 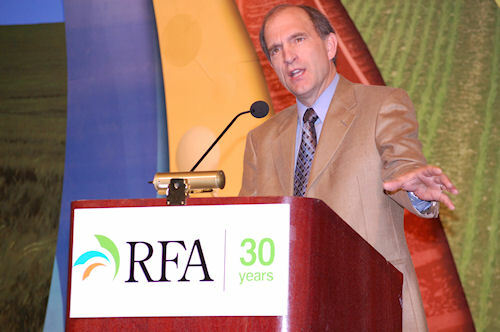 RFA’s Bob Dinneen (right) moderates the Washington Insiders Roundtable during the 2011 National Ethanol Conference. 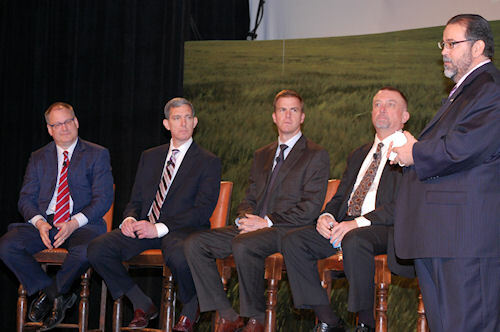 The panel included, from left: Mark Rokala, Cornerstone Government Affairs; Marty Durbin, American Petroleum Institute; Shane Karr, Alliance of Automobile Manufacturers; and Jon Doggett, National Corn Growers Association. Moving forward, National Corn Growers Association vice president of public policy Jon Doggett says the industry needs to move past the issue of E15 implementation and focus its efforts on keeping ethanol tax credits. "We can't let this be the issue that keeps ethanol from moving forward," Doggett adds. Even if ethanol proponents can agree to pursue the bare-bones agenda of retaining some form of ethanol tax credit, the question persists, "What sort of tax credit has the longevity to survive as Congress attempts to rein in spending?" According to a panel of tax policy analysts, there are several options available. David DeRamus, managing partner with Bates White economic consulting firm, details several viable plans. The industry could support another extension of the Volumetric Ethanol Excise Tax Credit, which provides a $0.45/gallon of ethanol tax credit to blenders. As a second option, the industry could support a slight tweak of VEETC where the tax credit is given to the ethanol producer. Another VEETC-with-a-twist option would involve moving the credit to the retailer. Iowa State University’s Bruce Babcock says Congress is likely to support an ethanol plan that does not burden the tax payer. One way to accomplish this is by raising the ethanol mandate, thereby attempting to grow demand. Purdue University's Wallace Tyner supports a change to VEETC where the tax credit is tied directly to oil prices, i.e. as crude oil trends upward, ethanol naturally becomes more competitive. In Tyner's proposal, VEETC incentives kick in only if crude is under $100 a barrel. At $50 a barrel, he proposes a $0.25 per gallon of ethanol subsidy. Yet another option is to pay tax credits only on gallons produced over the volume set by the Renewable Fuels Standard mandate. Relying on the RFS mandate to boost ethanol demand has the advantage of shifting the cost of ethanol from the tax payer to fuel consumers, says Iowa State University's Bruce Babcock. By taking this a step further and removing any tax incentives, Babcock says Congress can claim ethanol is a no-cost program. Instead, production incentives would come solely in the form of increased mandates. Moving forward, ethanol supporters must uniformly choose a plan and stick with its promotion. According to the Renewable Fuels Association, this is paramount if ethanol is to receive any support from Congress.